Zipper (open ended) 50-55 cm. 10 x 10 cm = 13 sts and 18 rows measured over stocking stitch using 6 mm needles. Check your tension and adjust needle size if necessary. Body and sleeves are worked in the round from lower edge to underarms. 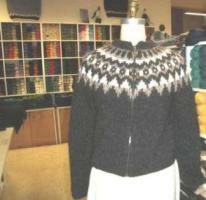 Body and sleeves are then jointed and yoke is worked in the round over entire cardigan. The front opening is made by sewing to rows of machine stitching in the centre of each chain of purl stitch before cutting up between the chains to form opening. Cast on 109 (115) 121 (127) 133 sts with color A using 6 mm circular needle. Work 4 rows moss stitch; *K1, P1*, K1, repeat this row. Join into a circle and cast on 2 sts (purl stitches) at beg and end of rnd. => 111 (117) 123 (129) 135 sts. Work in st st (Knit each round but purl first and last st of rnd) until body measures 30 (31) 33 (35) 36 cm from cast on. Set body a side. Cast on 28 (28) 28 (30) 30 sts with color A using 6 mm needles. 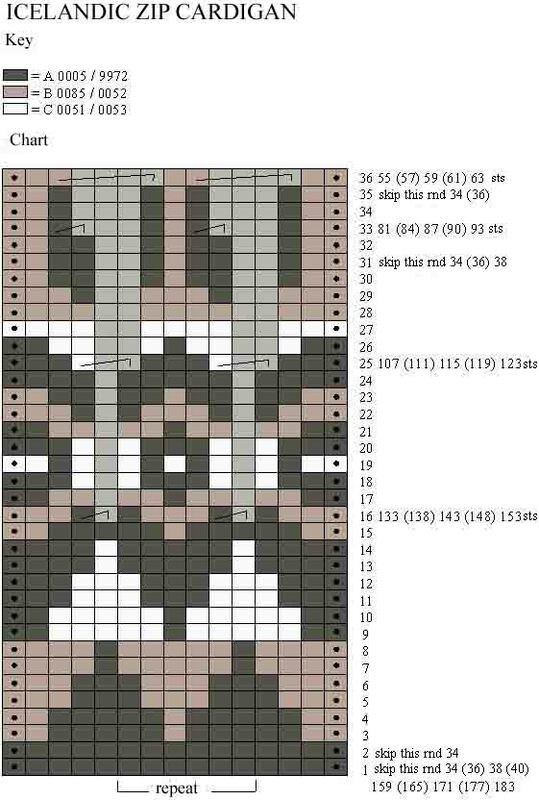 Join into a circle and work 4 rnds moss stitch as follows:Rnds 1 and 3*: *K1, P1*. Rnds 2 and 4: *P1, K1*.Count in st st and at the same time inc 2 sts 6 (6) 7 (7) 7 times (1 st after first st and 1 st before last st in rnd) every 12. (12.) 11. (11.) 11. Rnd => 40 40 42 (44) 44 sts. Count without further shaping until sleeve measures 45 (47) 49 (50) 51 cm from cast on. Slip 8 (8) 9 (10) 10 sts under arm to stitch holder. => 32 (32) 33 (34) 34 sts. Note: beg and end of rnds are at left side on back. Using large 6 mm circular needle join sleeves and body as follows: Purl 1 st, K 23 (24) 25 (26) 28 sts across right front, slip next 8 (8) 9 (10) 10 sts of body to st holder. Knit across first sleeve, 32 (32) 33 (34) 34 sts. Knit across back 47 (51) 53 (55) 57 sts, sl next 8 (8) 9 (10) 10 sts of body to st holder. Knit across second sleeve 32 (32) 33 (34) 34 sts. Knit across left front 23 (24) 25 (26) 28 sts purl 1 st => 159 165 (171) 177 (183) sts. Work in st st pattern from Chart beg and end with purl st. Change to shorter circular needle when rnds gets tighter. 55 (57) 59 (61) 63 sts. K1 rnd st st with color A and dec 4 (4) 6 (6) 8 sts evenly spaced across rnd 51 (53) 53 (55) 55 sts, (do not dec 4 centre sts). Change to 4½ mm needle and cast of first of rnd (P st centre front) and Cont in rib as follows; *K1, P1*, cast of last st (2. P st centre front), Cont in rib (back and forth) until rib measures 7 (7) 7 (7) 7 cm. Cast of loosely. Weave in any loose ends. Graft underarm sts together. Front opening: Sew two rows of straight tight machine stitching in the centre of each chain of purl stitch. Cut up between the two purl sts. Sew in zipper by hand Fold neckband in half to inside (hiding upper end of zip) and slip stitch in position.